I, Onischenko Boris Olegovich, was born 29th July 1977 in Cherkasy city in Ukraine. Address: Cherkasy city, Shevcenko street, 79, 18000. In 1999 graduated with distinction mathematical faculty of the Cherkasy State University (since 2003 Cherkasy National University) on profession "Mathematics and physics". After graduation of the university, I began to work by assistant of the chair of mathematical and software of automatic systems on the faculty of information technology and biomedical cybernetics of the Cherkasy National University. Since November 2002 on October 2005 has learned in post-graduate of Glushkov Institute of Cybernetics NAS of Ukraine on profession 01.05.01 – theoretical bases of the informatics and cybernetics. Main trend of scientific activity – stochastic global optimization. 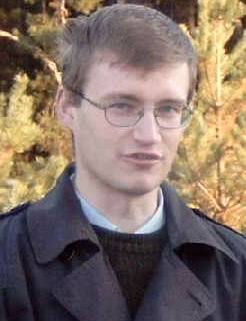 In April 2006 I defended the Ph.D. thesis by subject is "Minorant methods of global stochastic optimization". Scientific adviser: Doctor of Physico-Mathematical Sciences Norkin Vladimir Ivanovich. Now I work in a post of associate professor of the chair of software of automatic systems on the Faculty of Computer Engineering, Intelligent and Control Systems of the Cherkasy National University.